I was attempting to keep our goldendoodle's name a secret in all of my opening posts. I wanted to have a grand unveiling! Then I realized I mentioned it in the title of one post, so it might not be too much of a surprise. Since we all have names, we know that a name is a permanent, life-long commitment. As someone who refused to give up her maiden name, and now is about to hyphen last names to make a 17-letter concoction, I take names very, very seriously. We can't just randomly select a name and then up and change it the next day. Our poor dog will go crazy trying to figure out who he is. As I tell my English students, people are going to judge you in this world whether it be on your looks, talent, or knowledge. I don't think people should ever be judged on their looks, but your knowledge is fair game, so you'd better learn to write and speak correctly. Likewise, a dog's name is very telling about what his owners expect of him. To quote this site, "To qualify as a cool old man name, a name has to feel both classic and slightly moth-eaten, like the perfect vintage suit." Agreed. What name did we settle on? Milton. That's right. Milton. Why Milton you ask? Well, let's take a look at who our goldendoodle is truly named after. 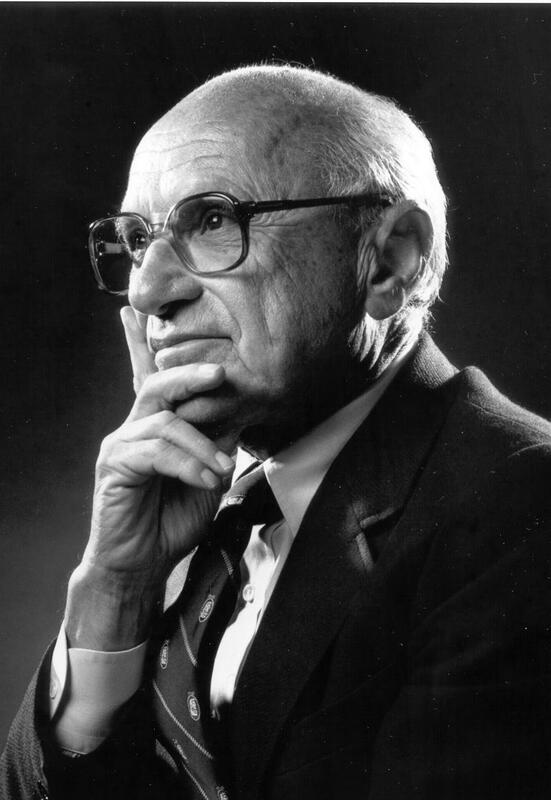 This is famed Nobel Prize winning economist Milton Friedman, who was an outspoken advocate of free markets, and one of Jeff's "personal heroes." He has many. Will our Milton be quite as educated and astute? I'll be happy if he's potty trained by the end of the summer. He is wearing me out. Milt on one of his many pottie excursions. Look at that natural focus and determination during his potty session -- Milton may very well present himself later on as an equally focused and determined force in the academic community, too.